Blessed with the Welsh gift of “sight,” Lady Arianna saw the vision in a golden bowl: a knight with eyes gray as the English sea that had captured her, his sword about to pierce her heart. And she trembled, not with fear, but with a desire that engulfed her very soul. On the treacherous border of Wales, Raine, the Black Dragon, rode his charger toward Castle Rhuddlan and the lady within. Illegitimate son of a Norman nobleman, his past was scarred by denial and mistrust, and now his future lay in the conquest of a fiefdom . . . and a woman’s love. As the battle trumpet sounded, Arianna, her Celtic pride unyielding, saw her dream take flesh: Raine, the enemy who inflamed her blood with desire; Raine, the lover she must gentle and tame, and then, as ancient hatreds threatened their lives, either cherish . . . or betray. 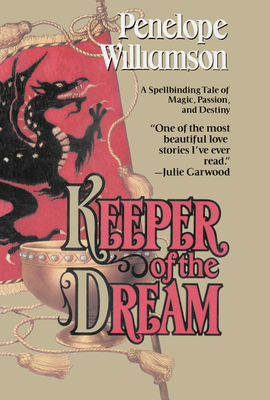 Penelope Williamson is an internationally renowned author of historical romance and suspense. Penny was born in Fairbanks, Alaska, and spent the first eleven years of her life as a U.S. Air Force brat. She has a BA in history, an MA in broadcast journalism, and was in the U.S. Marine Corps for six years, where she reached the rank of Captain. She has more than 1.8 million books in print, including The Outsider, Heart of the West, A Wild Yearning, Once in a Blue Moon, and Keeper of the Dream. Penny is a past winner of the Romantic Times's Best Historical Romance of the Year award and the Romance Writers of America's RITA awards. She lives with her husband in Mill Valley, California.